Instructions: Card size: 6" x 6" To make this shaped card start by folding a 12 x 6" pink card stock piece in half to make a 6 x 6" card base. Cut both sides (while folded) with the Elegant Pocket Accents outer die making sure to only cut in about 1 1/2" so that top of card and bottom of card remain straight edged about 2 1/4" each. Cut Decorative paper the same way only smaller (5 1/2") so that part of the pink card shows on each side. Cut 2 decorative elegant Pocket Accent dies (inside part) out of white then glue to outer edges of decorative paper and then glue to card base. 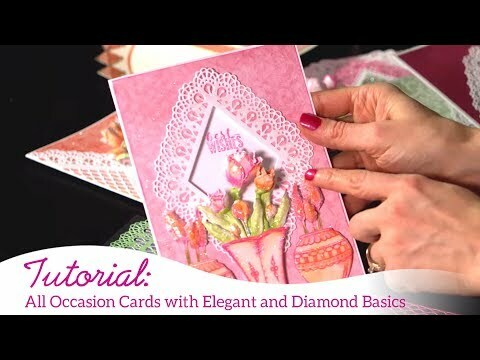 Cut a Lacy Diamond out of pink card stock and glue it to the center. Cut an eyelet diamond out of white and glue it to the center of Lacy Diamond. Find the wishing well on decorative paper and cut it out with a Diamond Basics and glue it to the center of the white eyelet Diamond. Stamp, sponge and die cut tulip blossoms in all 3 sizes using Magenta Hue and sponge with Pink Peony and Magenta Hue. Stamp leaves with Fern Green and sponge with Leaf Green. Stamp tiny blossoms from Floral Fashionista with Plum and sponge with Plum and die cut. Stamp Wildwood Leaves with Fern Green and sponge with Leaf Green then die cut. Form tiny blossoms with Deluxe Flower Shaping Kit and glue 2 together for each flower then fill center with Prills and glitter petals. Run tulip blossoms through die cutting machine with the shaping mold, press centers, glue 2 together to form flowers. Glue each flower to a stem with leaves. Shape leaves and stems with Groove Tools, glitter flowers. 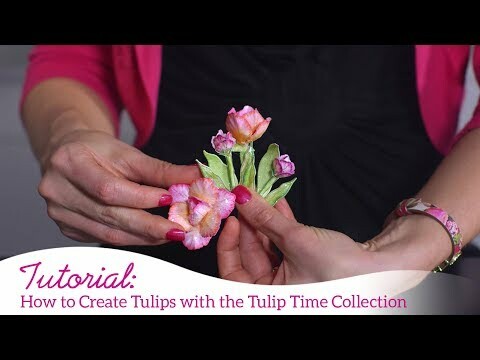 Arrange tulips on both sides of wishing well diamond and glue in place. Scatter tiny blossoms around arrangement and glue them in place then add extra leaves where needed. Cut Thinking of You sentiment from decorative paper and fish tail ends then nest in the bottom of arrangement and glue in place. Tie a bow with the ribbon and glue to bottom of card. 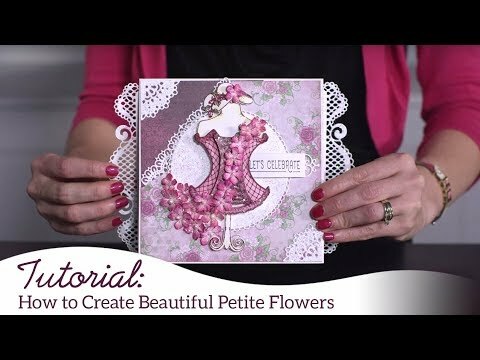 Stipple glue on flowers in the decorative paper and add glitter. Finish inside of card as desired.